Shimizu Saki: Kudo Haruka-chan. Kuduu's adorable ♥ I'd like to try becoming friends!! Tsugunaga Momoko: ANGERME's Wada Ayaka-chan. I'd like to try going on a date with her ♥ Anything except going to art museums or Buddha statues!! Sudo Maasa: Morning Musume。´15's Fukumura Mizuki-chan. Recently we've been exchanging a lot of messages, which makes me want to talk with her even more ♥ I'd like to hang out together next time. 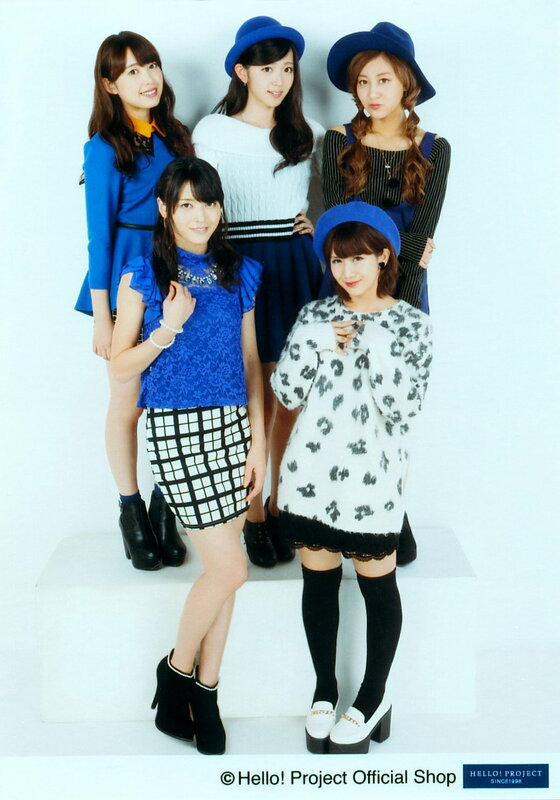 Natsuyaki Miyabi: The new members of ANGERME and the new members of Morning Musume。´15. Kumai Yurina: Kuduu ♥ I really like Kuduu's singing, we've had normal conversations together, and I know her contact address, but I'd like to know her better! Hagiwara Mai: Kudo-chan. Then Funaki-chan. Ikuta Erina: Murota Mizuki-chan. She's participated in Morning Musume。 concert tours as well, and aren't there some things about her that resemble Erina? Sayashi Riho: Everyone (lol). Coming back to the question, there isn't anyone who I'm really great friends with...... Although I do enjoy being by myself, I'd like to communicate with various members even more! Suzuki Kanon: Aikawa Maho-chan, Murota Mizuki-chan, Ogata Haruna-chan. 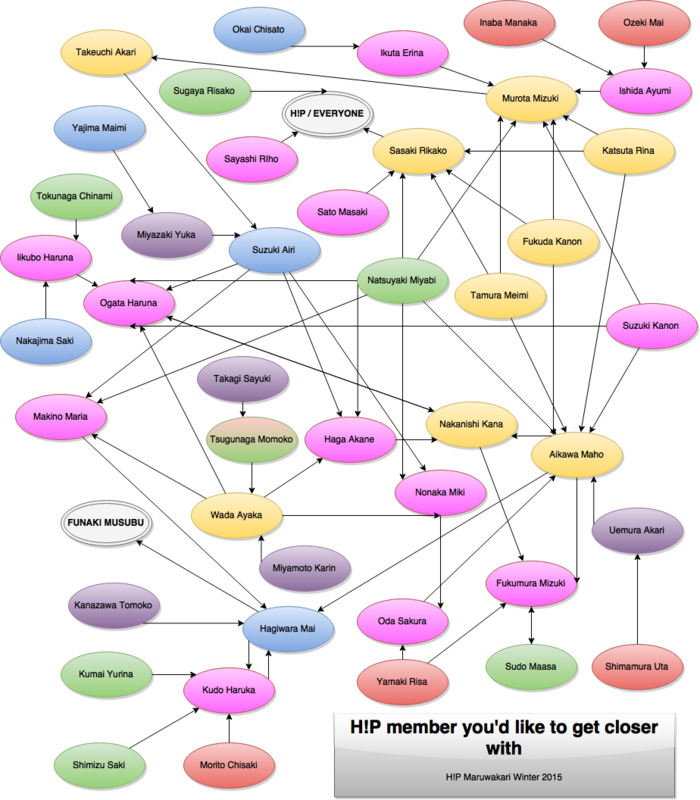 We're all in the same academic year, and the increase of more H!P members in the 1st year of senior high have made me interested in them. Iikubo Haruna: 12ki member Ogata Haruna-chan. While I'm interested because she's 'Haruna' as well, I've got my hopes up since she's from Osaka, she's definitely got to be a funny girl~. Ishida Ayumi: Murota Mizuki-chan. When Murotan was a Kenshuusei, I watched her act as a backdancer for Michishige-san's solo song 'LaLaLa no PiPiPi' and I thought that she was cute, so I really would like to talk with her. Sato Masaki: S/mileage's Sasaki Rikako-chan. Well~, she's quite the beauty, but she's a reallllly funny kid. So I'd like to become like her, able to talk about anything! Kudo Haruka: Hagiwara Mai-san. We've been friends ever since we got to do a photo shoot together. I often get messages from her, and we've promised to go for a meal!!! Oda Sakura: Aikawa Maho-chan. She's just gotten into ANGERME, but her tenure as a H!P Kenshuusei was brief, so I haven't really talked with her. I'd like to talk with her a lot. Ogata Haruna: ANGERME's Nakanishi Kana-san. We both hail from Osaka, and I had tons of fun when we met the other day and got to chat. Nonaka Miki: Oda Sakura-chan. As the senpai that's closest to me in age, she always talks to me with a kind voice, so I'd like to get close with her! Makino Maria: Hagiwara Mai-san. Even though I have to apologise because I'm a new member, I'd like to quickly become friends with Hagiwara-san. Because I love Hagiwara-san. Haga Akane: Nakanishi Kana-san! We got chummy at the 2014 summer Hello!s, but she's super kind, I'd like to get closer to her. Wada Ayaka: The 12th gen members. I haven't really had the chance to talk with them, so there are lots of things about them I find mysterious. Fukuda Kanon: The 3rd gen members, AiAi, Murotan, Rikako-chan! I think I'd like to deepen my bonds with the new members in my own group first. Nakanishi Kana: Fukumura Mizuki-san and Ogata Haruna-chan!! I still don't know how you're like, so I'd like to become friends and talk lots with you. Takeuchi Akari: Suzuki Airi-san. We've recently gotten closer, so I'd like to talk with her even more from now on. Katsuta Rina: ANGERME 3rd gen members. 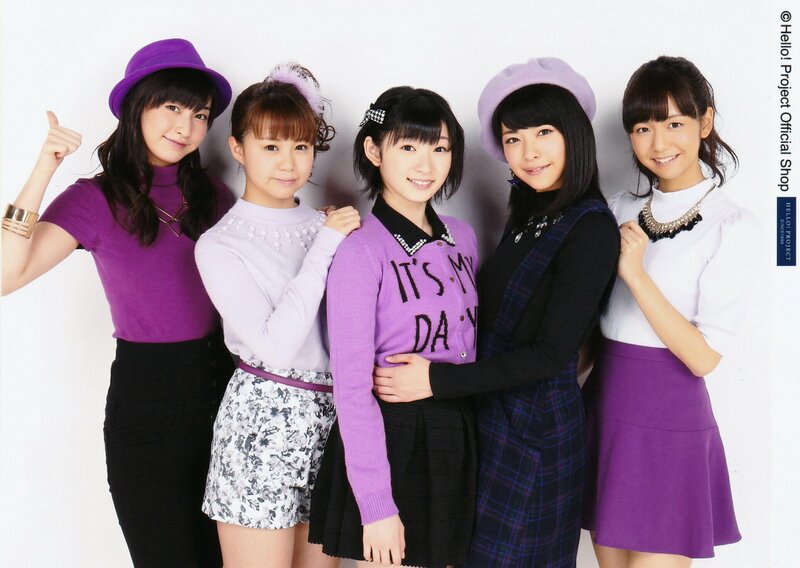 Tamura Meimi: ANGERME 3rd gen members! Murota Mizuki: Takeuchi Akari-chan. I love how she's always smiling! You often fall over, so be careful okay. Aikawa Maho: Nakanishi Kana-san. She always talks to me, she's friendly and funny. Fukumura Mizuki-san. She's cute, and seems to give out an aura of kindness. Hagiwara Mai-san. Cute, fashionable, I look up to her. Sasaki Rikako: I'd like to be friends with all of Hello! Project! Kanazawa Tomoko: Hagiwara Mai-san. Since we're the same age, I'd like to talk with her about all sorts of things. Also, her singing is really cute, so I'd like to try singing together with her!! Takagi Sayuki: Tsugunaga Momoko-san. We went around on a Naruchika tour together, but even now I still feel nervous when I'm talking with her. Miyamoto Karin: Wada Ayaka-san. Because we chatted at the summer Hello! Project concerts and she was really kind to me. Uemura Akari: Aikawa Maho-chan. I still haven't really talked with her, so I'd like to try having a chat. There might be some affinity too due to our tall statures. Yamaki Risa: Fukumura Mizuki-san. She has this image of being gentle, so I'd like to go for tea on a sunny day and have a good chat together with her. I chatted with Oda Sakura-san at the Hello! Cons, it was tons of fun, so I'd like to get closer to her. Morito Chisaki: Kudo Haruka-san. Since we're the same age! She's really cute, so I'd be glad to become friends with her. Shimamura Uta: Uemura Akari-san. Since people say we're similar, and I happen to think of her as my older sister of my own accord. Ozeki Mai: Morning Musume。´15's Ishida Ayumi-san. She's really good at dancing, so I'd like her to teach me! Everyone wants to be friends with the 3rd gen - 7 mentions from Murotan, 6 for AiAi, 5 for Rikako. For the 12th gen, people seem to be most interested in Haachin, with 6 mentions. The other 12th gens had 3 mentions. Other girls who were popular (4 mentions) were Kudo, MaiMai, and Fuku-chan.